Here at io9, we never miss a chance to make things that normally don't turn hot and glowy into things that are hot and glowy. In the spirit of this, it's time to give you a chance to set fire to steel wool. Iron is rather famous for not catching fire. It goes into engines and fire place pokers and stoves for exactly that reason. (The one car company that abandoned iron and steel to make their engines out of dried grass and newpaper strips sunk quickly under the weight of lawsuits filed by their customers' surviving relatives.) However, if the piece of the iron is thin enough and the heat is high enough, the material will burst into flame. And not just ordinary flame - bright orange, sparking, psychedelic-looking flame. You'll need steel wool, which is mostly iron. You'll need a nine-volt battery - the kind that has its leads sticking out of the same end. Lastly, you'll want to have a stick made of something that doesn't conduct electricity. Wad up the wool and place it on a nonflammable surface. Touch the leads of the battery to the wool. If the wool gets fused between the leads of the battery, use the stick to pry it off. After just a few moments of contact, the wool should go up in flames. Normal wires don't generally catch fire in this way, but they have a larger resistance. Tiny strands of steel wool have a low resistance and let the electrons pour through them in massive quantities. This heats up the wires to the point where they grab oxygen from the air around them. This process is exothermic, giving off enough heat to warm up the next stretch of wire and so the next bit oxidizes and the whole thing goes up in smoke. What's left behind should be iron oxide. This particular form of iron oxide will be bluish, a sign that a lot of oxygen has gone into the iron quickly. A more common form of iron oxide, with slightly less oxygen bonded to the iron, is red. It's simple rust. 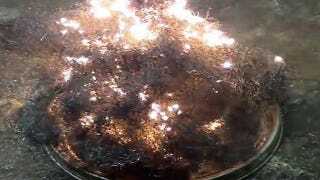 For a more pyrotechnic display, take a look at this.